Garden Photo of the Day: The Hydrangea Lady's legacy - the what ifs? The Hydrangea Lady's legacy - the what ifs? Fifty years ago yesterday on July 5, 1965, I was struck by lightning. It is amazing that I wasn't killed or that I didn't suffer any permanent physical or mental damage. This is what happened: I was working as a lifeguard the summer between my sophomore and junior years at Vanderbilt. The other lifeguard - my childhood friend Millie - had gotten me the job. It was a sunny day, but in the afternoon, I heard a distant rumble of thunder. You could barely make out a small storm cloud out to the west. I had a history of being afraid of lightning, so I got off the lifeguard tower and walked around to ask Millie if she thought we ought to get the children out of the pool. Her words were, "If we hear any more thunder, we'll blow the whistle." I walked back around the pool and climbed up on the metal tower, and BLAM! - a brilliant flash and a deafening crack, followed by earth-shaking thunder. At the moment the bolt hit (witnesses said I "lit up"), it was as if a giant had hit me on the top of the head with a huge sledge hammer. The deepest, most intense electric shock went through my body. The next thing I knew, I was in the dressing room in the club, staring at the burned bottoms of my feet. Well, I obviously didn't die. Millie had calmly gotten everyone out of the pool and into the clubhouse. But the sun continued to shine, and there was not so much as another rumble of thunder nor a drop of rain. I had a tremendous headache, but that was it except that my feet were tender for a couple of weeks. So, yesterday, on the 50th anniversary, I thought about how lucky I was. Then, I went into It's a Wonderful Life mode, thinking that there would have been no Anne Tate Pearce or Laura Tate Yellig or a 10-month-old jolly granddaughter named Carter Pearce. Chip Tate would have married someone else and would have had different children. I couldn't think of much of an impact I've had, but it did cross my mind that there might not have been eleven years of A Gardener's Diary on HGTV or a Flower Guild at the Peachtree Road United Methodist Church, two things I did have a hand in creating. I didn't get very far with my "what ifs", though, because I started thinking about the post I'd begun working on a few days before about the late Penny McHenry, a.k.a. The Hydrangea Lady and founder of the American Hydrangea Society. I remembered the story Penny told me when I first interviewed her. 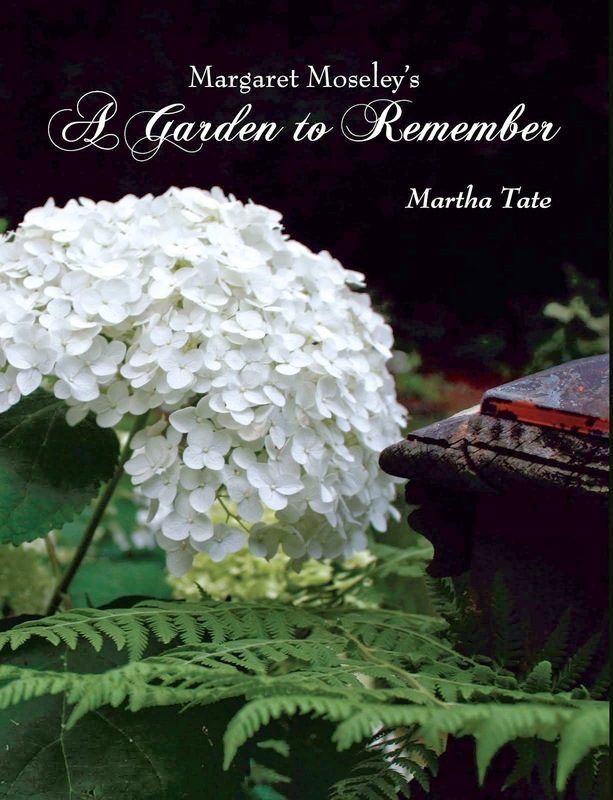 What if she hadn't planted those potted hydrangeas she had received as gifts decades ago? And, what if she had just left them alone instead of figuring out that she wanted more and thus started propagating them. We would have no 'Penny Mac's, nor any 'MiniPenny's, nor any of the other re-blooming hydrangeas that have one of her hydrangeas as a parent. And, her daughter Marcia Melick probably wouldn't have the fabulous hydrangea garden she now tends on a precariously steep hillside in Sandy Springs. For sure, I couldn't have taken the photo of those 'Annabelle's pictured above. This row is right below Marcia's front terrace, but the entire hillside is covered with descendants of her mother's extensive collection of hydrangeas, along with many other shrubs and perennials. Marcia is continuing Penny's tradition of propagating in a big way. Every year in late winter, she goes out into her expansive garden, which contains trails that wind along terraces cut out of the slope, and does her annual trimming of the 'Annabelle's. Then, she takes the lopped-off branches and pushes them down into the ground, not even bothering with a rooting hormone. In just a few weeks, the "sticks" start leafing out, and she finds herself with dozens and dozens of new 'Annabelle's. She has given away hundreds. After having lost a host of 'Annabelle's to deer, I now have a protected place, and this year I enjoyed a couple of giant blooms up next to my house. Marcia also gave me a black plastic pot with several "babies," so now I'm going to have tons more flowers next year. I try not to think of twists of fates very often. I'm glad, though, that somehow someone told me that Penny McHenry would be a great subject for an article in the newspaper. She then introduced me to her friend Margaret Moseley, which led me down even a different path to television episodes (we taped both Penny and Margaret twice, years apart) and eventually to a book about Margaret's garden. Marcia often reminds me that I should have written a book about Penny. I wish I had, but her influence has been felt all over the world. I'm just grateful that she planted those first hydrangeas and that I got to know this funny, vibrant, enthusiastic woman who passed along a great gift to us all. Note: I have taken the liberty of writing 'Annabelle' with an s at the end to indicate the plural. That's not really correct, but it prevents you from having to read Hydrangea arborescens 'Annabelle' over and over again. Now, I could do a ton of "what ifs", just about the 'Annabelle' hydrangea and how it came to be in so many gardens from just one garden in Anna, Illinois. We'll save that for another time. I just don't know what to say. You have led a magical and blessed life.